Penguin Days takes the reader on a journey. In the second book in this endearing series by Sara Leach, Lauren and her family travel to Lincoln, North Dakota, so Lauren can be the flower girl in her auntie Joss’ wedding. It takes Lauren’s family “two days, eight movies, four chapter books, and three throw-ups” to get to their destination. This is perhaps as good of a time as any to stop and ponder how many children’s books take place in North Dakota. Zero? That’s the common answer. The reader gets a no-nonsense view of the world from Lauren’s eyes. She doesn’t like change; she hates texture in her clothes; she’s particular about what she eats; she takes what people say literally. When Lauren’s auntie tells her she’s priceless, Lauren responds, “‘Kids don’t have prices,’ I said. Unless she’d been planning on selling me at the end of the wedding.” The very thought of it stresses Lauren. At moments of increasing stress, Lauren’s lizard brain can take over. Sparks fly inside her head. She survives by square breathing and squeezing erasers. Most of the time in the book it works. But there are moments when the flying sparks frazzle Mom and Dad. It’s helpful for the reader to see that just because Lauren’s family understands ASD doesn’t mean it’s always easy. Rebecca Bender’s whimsical pencil drawings on most pages contribute to comfortable reading for those just stepping into chapter books. The illustrations capture emotions and reflect a lovely childhood innocence. Along with the many illustrations, young readers will appreciate the simple sentence structure and vocabulary. Early chapter book readers will find the chapters are bite-size in the amount of text. Yet the same reader can feel a sense of accomplishment in the number of pages covered. The pages have plenty of white space, which also contributes to more comfortable reading. 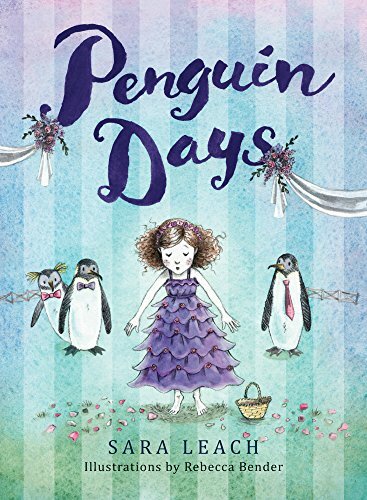 Penguin Days provides learning of the most important kind, and has an added bonus of sweet humor, age appropriate text, and engaging illustrations. It belongs on the shelf of every library for young readers.